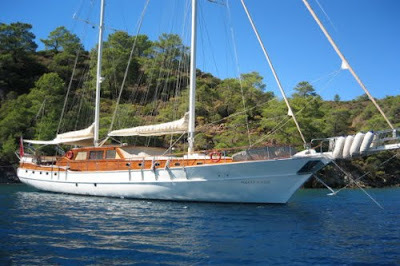 Aegean Schatz is available for charter in the Mediterranean. There are five cabins. Three doubles are located in the aft part where you can access them from the left side of the salon by stairs. The cabins are spacious and comfortable with ample storage space. The floor is mahogany wood. The ceiling is decorated with an off white alcantara. The wall panels are made by cherry wood. On the other side of the salon, next to the pilot house, you have some steps that lead you to the corridor where you can find the master cabin and the twin cabin. All ensuites have big and comfortable showers. The interior decoration of the cabins is simple and minimalist but very elegant. On the aft deck there is a big wooden table with ten teak wood comfortable chairs where clients can enjoy meals or their refreshments on the fresco. All the aft area can be covered by a big marque that can be opened partially or totally. As we enter in her bright and big salon, we find on the left side a semi circular light beige couch, with a table that can be lifted or lowered at the height that you require. Further down on the right side, we have a large wooden bar, from where you can access a very large galley with several fridges and freezers, fully equipped. The floors of all the yacht are made by mahogany wood and the walls of precious cherry wood from Africa, which make the yacht smell wonderful. All the blinds are made in elegant cherry wood.